Play is necessary for everyone. Play is a part of how we relate to one another and strengthen our connections with others around us. "There is laboratory evidence that there is a play deficit much like the well-documented sleep deficit." "A lack of play should be treated like malnutrition - it’s a health risk to your body and mind." "an absorbing, apparently purposeless activity that provides enjoyment and a suspension of self-consciousness and sense of time. It’s self-motivating and makes you want to do it again." Play is not only part of the human experience, it’s part of the animal kingdom as well. Did you know that animals play? It’s incredible to watch animals that are typically predator and prey PLAY together. And they can read each other’s signals to know that it’s playful and not dangerous. Fascinating! To see some video footage of this, watch Dr. Brown’s TED Talk. What’s extremely interesting is that when play is lacking, socialization suffers, both in humans and in animals. Cats and other social mammals who are deprived of play can’t socialize successfully. "Like sleep, play seems to dynamically stabilize body and social development in kids as well as sustain these qualities in adults." "Humans are social animals, and play is the gas that drives the engine of social competence. Play allows society to function and individual relationships among many to flourish." There’s enormous pressure these days to push academics, starting in kindergarten and even preschool. But play is the best way to learn anything! How do you learn how to negotiate, work with others or problem solve? The best way is through play! "Learning and memory..seem to be fixed more strongly and last longer when learned in play." 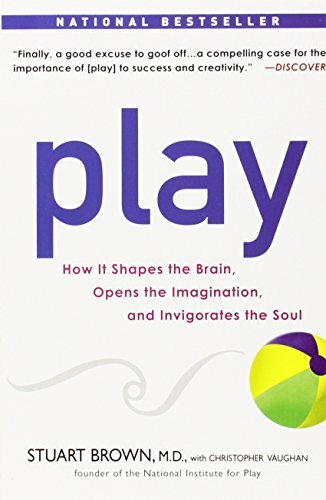 There are 8 play personalities - this concept is so interesting. As I read these different types, I was able to see myself and my own family in these play personalities! Also, you’re not limited to only having one play personality. What’s your play personality? I fall into the artist/creator and director categories. My husband is a joker and an explorer. My son is a kinesthete and a joker. And my daughter is a collector & director. If you’d like to learn more about the important role play has across our lifespan, pick up Play today!